To provide the user from products that gives proper safety, strength and perfection, IVANKOspendsyears manufacturing and constructing a single Olympic barbell. 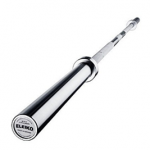 Ivanko Olympic Bars are very precise constructed equipment that even after using them for a while, you won’t get tired of them even after and still choose them over any multi-purpose barbell. The Knurling on Ivanko barbells are done with respect to IWF specifications, and they follow a policy of not returning back the product unless there is a manufacturer defect on them. The bars and all other equipment by Ivanko are constructed in USA. Ivanko engineers have even specified the chemical analysis of its barbell in user specification which comes directly from an accurate mill. However, the exact chemistry and step by step manufacturing details is not offered because of lack of time due to research and development. When it comes to testing their bar thoroughly than no other company, than Ivanko Barbell is the first name that clicks in mind. Each Ivanko bar is verified to find defects in steel by doing some analysis of mag, x-ray and ultra-sonic. There is also a straight test for barbell to make sure that it is not having deflection more than 0.006/ft with respect to length of the bar. The OB-Ivanko 20KGOlympic bar comes in coating of dark black oxide which gives a very glossy and attractive look making it simply eye warming from rest of the barbells available in the market. The steel shafts which consist of a standard diameter of 28mm which is widely used for Olympic weight lifting. 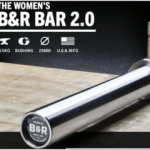 The Ivanko bar are rated to have a steel shaft of more than 200,000 PSI which is a massive increment from 190,000 PSI that is considered and used widely in barbells around the world. With all such features, the price of Ivanko OB is very reasonable that if a person is looking for a barbell with all such aspects than affordability won’t be a big issue for him to consider. There is also a stainless steel version produced by Ivanko which also consist of all such features as Ivanko OB-20kg. 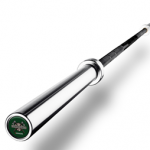 The only difference between both the barbells is of quality and coating. The stainless steel version gives an extravagant yet an expensive quality as compared to black oxide one which is more of budget friendly. The Ivanko stainless steel version have a massive tensile rating too of 218,000 PSI which is a very weird step taken by engineers of Ivanko because the bar itself is very durable, so why have a tensile strength that much greater. Though, that thing is up to them but I think the oxide bar is more pocket friendly with an adjustable quality. The reason of giving a tensile strength greater than 190,000 PSI (even though this massive one) is due to the philosophy that Ivanko usually look upon is that they want to manufacture a product which is beyond perfection and even after that (having a 190,000 PSI strength) they are never satisfied from it, so they heat their barbell more to make the tensile strength go above 200,000 PSI. Most people mainly think that their bar is straight enough, which will provide a proper movement during heavy weight lifting. Ivanko consider this thing as an important factor for its construction and gives an account of precision straightness in user specification manual. Most of the users think that their bar is quite straight enough because they are meeting the industrial standard of 0.008 inch deviation over a seven foot long bar, but Ivanko further reduce this figure of precision to 0.01 inches, which makes the lifting especially heavy ones, quite easy and comfortable due to the fact that the rotational torque is an inch and bullet straight. There is a certain misconception present in peoples’ mind regarding durability and quality, that they consider a bar safe and secure just by looking its construction, whether it’s of steel, chrome, zinc or oxide. Though, the material also plays a huge role in construction, but the testing of barbell is the factor which matters the most. The Ivanko bars goes from Ultrasonic test in which magnetic particles goes from each barbell to find an external and internal peels and defects, and preventing them to spread over time leading the bar to break open. Comes with a massive tensile strength of 200,000 plus PSI. 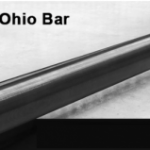 The Ivanko bar is Magnetic, Ultra-sonic and X-ray tested to find any faults or defects internally or externally from the bar. The bar is straight with a figure less than 0.006/ft. The weight of the bar is extremely standard and accurate of 20kg. The bar is grounded and polished with black oxide. Black oxide finish gives a bossy and traditional look. Consist a shaft diameter of 28mm which is best for Olympic weightlifting. The bar meets all of IWF specifications. The length of the bar is seven feet and two inches. The bar is constructed and manufactured in USA. The shipping is included in barbell’s price tag. In my opinion, this bar is different from the barbells in which the ease of use is greater while performing deadlifts, squats and cleans. The Ivanko OB-20 is a different barbell with some variance in specifications. 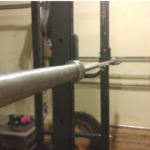 The power lifting on this bar is widely done due to the fact it’s got much greater tensile strength. Though, Olympic weight lifting is not really recommended on this barbell because the improved tensile strength of over 200,000 PSI is not suitable and standard with respect to IWF and competitive level. The OB-20kg doesn’t really follow all of the IWF specification because of the knurling pattern that goes wrong while Olympic weight lifting. Though except that it’s a pretty solid barbell which helped as being a beginners a lot. Due to the fact it improved my form and focus on muscle a lot with correct movement of certain exercises like deadlifts, clean and snatches. Having a certified warranty of testing fromMagnetic, Ultra-sonic and X-ray, it gave me a relief and satisfaction that this barbell is fault free. Thus it was my first online purchase and I was a bit worried with respect of internal quality. Overall, I was very comfortable and satisfied with the barbell and it is recommended for everyone to give it a try too. Have a massive tensile strength of 200,000 plus which have the ability to handle any wear and tear of regular gym abuse. The bar is bullet straight with a weight deviation figure of less than 0.006/ft. The black oxide finish gives a very eye warming, glossy lock which makes the user to workout with them more. 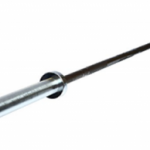 Shaft diameter of 28mm is supported which provides an excellent whip during heavy Olympic weight lifting. Ivanko is very serious to deliver best quality product, hence the barbell can be changed if any manufacturing issue is been found. The bar is very expensive than most of the black oxide barbells. Black oxide may chip off after several use. Oxidization of black oxide can be found in humid regions.